Carluke Golf Club was established in 1894, with the club’s first course situated in the Belstane/Whitehill area. Shortly after, the club moved to Langshaw, near Braidwood but that too became a short term lease when negotiations with the Coltness Iron Company resulted in a move to the present Hallcraig estate, where a 9-hole course was laid out and a clubhouse erected behind the current 12th green. By 1920, the course had been extended to fifteen holes but before the end of the following decade, a full 18-hole layout had evolved. Everything stayed in place (on a course configured with seven par threes and one par five) until the mid-1960s, when the clubhouse was relocated and the sequence of holes was revised accordingly. When the club’s centenary arrived in 1994, the old downhill par three 1st hole had been replaced by two par fours playing in opposite direction to each other in front of the clubhouse and the former short par three 14th was no longer in play. Essentially, the layout that is in use today was in full operation. With only two par fives and four par threes on the card, the par at Carluke is set at 70 on a course measuring a shade over 6,000 yards. On the front nine, the par four holes at 6 and 7 demand the sort of respect that their stoke index of 1 and 3 might suggest whilst on the inward half, the plunging downhill tee shot at “Glenburn,” the 127-yard par three 11th, is a real highlight of the round. I played here in the Gents Senior Open a couple of months ago and thoroughly enjoyed my round on a very pleasant little track. 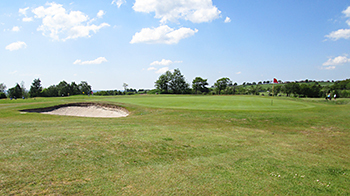 It starts off with a cracking opening hole which dips down left to the 1st green, followed by three shorter par fours, any one of which might produce a birdie opportunity. The par three 5th is followed by strong par fours at holes 6 and 7, where a “5” on the card will feel like a par. There then comes the most ludicrous hole I’ve encountered in many a long day, a 195-yard par three where the tee shot’s played across the preceding green through a gap in the trees which can measure no more than ten yards – if ever there was a case for prudent pruning then it’s here at this hole! In total contrast, the next par three at the 11th is a thing of beauty, with a short iron played from a very elevated tee position down to a heavily sand-protected green that sits beside a stream. A daft short par four follows, but this is just a transition hole to take the routing out of a little valley and back up to the main level of the course. The only par five on the back nine, the 15th, plays downhill to a tricky 2-tiered green, followed by “Dodgers Last,” the final par three on the course, which flirts with out of bounds on the right hand side of a very narrow fairway. The home hole is a bit of a disappointment, a short par four kinking slightly right to the target but overall, Carluke’s a decent little layout that’s maybe worth a play if you’re in the area. Carluke has a lot in common with other courses set in the moorlands of South Lanarkshire, notably Carnwath. There is quite a variety of holes with interesting changes in elevation. The 12th stands out for the wrong reasons; despite extensive alteration it remains extremely silly. Both the 11th and 16th, on the other hand, are fine par 3s. Carluke is a course worth playing but you will not rush back.